Lately, I’ve been bitten by the baking bug. Yes, its the Christmas season and will be on a baking spree over the next few days, baking cookies, muffins and cakes. Yesterday, I baked a batch of Mocha Chocolate Chip Muffins which I bookmarked from Divya’s blog who found this tasty treat at Baking Bites. 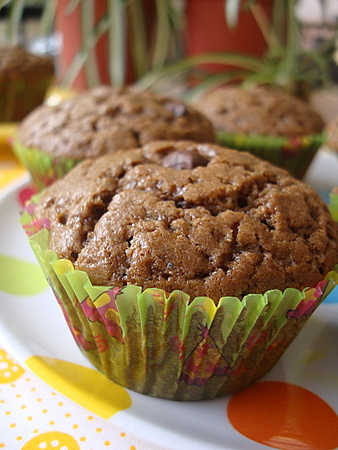 These addictive muffins have a subtle flavor of coffee and a pronounced taste of chocolate. 2 In a large bowl combine the flour, sugar, baking pwd and salt. Use a whisk to combine. Set aside. 3 In another bowl melt the butter and while its still warm, stir in coffee pwd and cocoa pwd. 4 In another bowl, mix eggs, milk and vanilla. 5Add the egg mixture and butter mixture to the dry ingredients and mix until well combined. Fold in the chocolate chips. 6 Spoon the batter into the prepared muffin liners till three-fourths full. Bake for about 20-22 minutes or until a toothpick inserted in the center comes out clean. 7 Place on a wire rack to cool and remove muffins from pan. Serve warm or at room temperature. To make it eggless replace the eggs with a large mashed banana and 3 tbsps yogurt. nice recipe for new year as well as christmas. do u mind telling me where do we get chocolate chips in visakhapatnam? You get Chocolate chips at Vinod & Co, Poorna Market road. I love ur recipes…have tried many of ur recipes and they come out very well. There have been many requests for Pressure Cooker Cakes. Its been ages since I baked in a cooker. Will give it a try for your sake and all the others who requested and if it comes out well, I will definitely blog. Cute and gorgeous muffins, very perfect..
looks amazing and easy to bake for kids! Nice recipe for easy baking. Pictures look delicious and I have to try it for a delicious comment on taste. Instant coffee powder? Can i use BRU instant coffee powder? Let me know. Thank you! Yes, you can use Bru or Nescafe Instant Coffee powder. Beautiful beautiful! This is what I am doing this weekend! Made them. They look great. Did your batter turn out thick too? I’d forgotten cocoa and coffee together would be very drying. It was a pain dropping tablespoonfuls into the lined cases, but they seem to have come out OK. Thanks for the recipe. Yes, it will be a slightly thick batter. Adding 2-3 tbsps milk is fine. 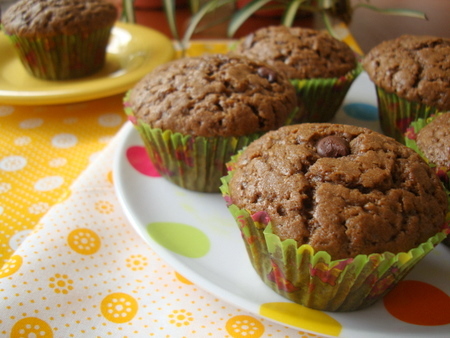 Love the chocolaty color and texture of these cute muffins. Would try the egg less version soon. these look so nice, I LOVE coffee flavor in baked goods. Thanks for the tip on how to make them eggless too. Wow, some great flavors in a muffin! Tried it this afternoon Came out very well. Will be making again. they look soooooo tempting. Could u please tell me which oven do u use? I want to buy an oven for baking, making pizzas etc. I use an OTG (Oven/Toaster/Grill) Murphy Richards. Liked all your recipes, I would like to try them but I have problem with measurements particularly in baking recipes, can you give them in grams, it will be easy for me to follow correctly. Here’s the link to my post on Measuring cups and spoons..
Hi Kavitha. When I baked in my microwave I usually needed 5-8 minutes at 900W for almost all cakes. 5 minutes seem to suffice for cupcakes and some bundts, while most sponges (say 1-2″ high when fully cooked) were comfortably done at 7-8 minutes. I hope that helps. My general rule of the thumb was when the recipe asked for the cake to be baked at approximately 200 degrees C for 45 minutes, it would need 8 minutes on microwave mode at 900W. Remember to let the cake rest for a few minutes before you test the centre because microwaves generate heat from within the centre of the food so the dish continues to cook even after the timer goes off. Lastly, always reduce the flour if you’re baking in the microwave (say if the non-microwave recipe called for 175 gm, I’d use 150 gm) because microwaves dry the cakes out unlike the conventional ovens. and Shailaja di..ur recipes make me drool all the time..
Samidha, I used glass. Glass casserole lids, shallow casserole dishes or baking dishes. Please don’t use plastic. Even the microwave-safe plastic ware has been known to melt. Cakes will not form a hard crust in microwaves, nor will their sides brown. So don’t get alarmed if yours don’t. I never did bake cookies in mine so I can’t tell you about that. Here’s a fruit cake recipe I blogged earlier. Hi Sailu, the muffins are awesome ! You have been tagged in my post “I am Tagged”. See the post and answer the same questionnaire. wonderful recipe. just want to know which cups to be used in oven to fill the batter. didnt understand muffin liners, being a beginner i have lot of doubts, hope u reply..
Muffin liners or paper cupcake liners. You will get them in any major departmental store or you can find out from your local baker as to where they get their liners from. Alternately, you can use aluminum molds or muffin baking tray. Just grease and dust with flour before pouring the batter. I maded these yesterday, minus the chocolate chips… They were very simple to make, and came out beautifully! Thanks for the great recipe. These little cupcakes are getting baked….rite now…just now made a batch my tray holds 12 and i somehow filled it and ate 2 spoons remaining…my 3 1/2 yr old daughter loved the raw scoop she got and wanted more….and eagerly waiting to taste…coz the smell is something i can’t explain in words…. 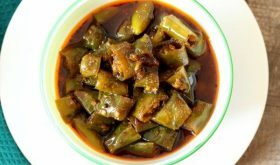 Anisha, I do have another blog dedicated to kid friendly recipes – http://kidszone.sailusfood.com. Check it out. They look delicious! But where do you get your cup cake liners? My sister bought me some cupcake liners from the US, Rachel. I’ve made these a couple of times and each time, the smell is to die for. I add some more milk than mentioned in the recipe (as you suggested, Sailu). Thanks for the recipe. Some generous splashes of milk in addition to the amount you mentioned made really moist cupcakes tonight. I love this recipe, thanks again. ive seen your recipe and i liked it. but can you tell me how to prepare it without putting eggs???? Add a mashed large banana. Tried this today, It turned out really well. Thanks for the recipe. Simply tasty recipe! Really Loved it!! Looks delicious with a glass of milk.